SoftComply eQMS is a quality management system packaged as an add-on for Confluence. IEC 62304, ISO 14971 and 21 CFR 820. SoftComply eQMS has a Quality Manual, a Quality Policy, 17 SOPs and 50 document templates pre-filled to fast-track the development and implementation of your QMS. Just add your company and product development details! SoftComply eQMS is fully customizable to any medical device development project. SoftComply eQMS is fully integrated to Atlassian Confluence. SoftComply eQMS contains embedded guidance on how to customize the SOPs and technical documents according to your company and the device. SoftComply eQMS contains a completed Quality Management System, an Example QMS, of a made-up company and its device, illustrating how to customize the SoftComply eQMS for your specific needs. 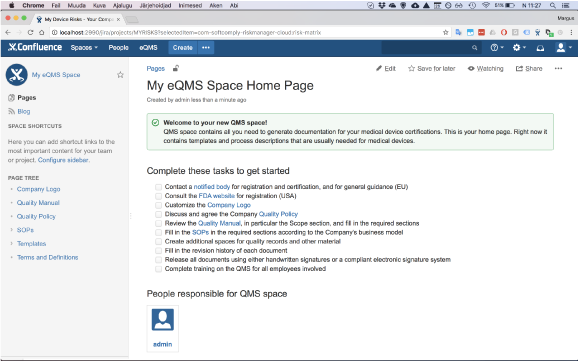 SoftComply eQMS provides a home for all QMS documentation as a space in Atlassian Confluence. You can easily copy QMS templates into other project spaces that need to comply with your Quality System requirements – quickly managing the QMS requirements in various projects you run! SoftComply eQMS is comprehensively focused on the EU and US markets helping users fulfill their requirements for ISO 13485, IEC 62304, ISO 14971, 21 CFR 820. Your QMS is a designated Space in your company’s Confluence – home to all of your QMS related documents. The SoftComply eQMS comes with a full sample QMS that provides a full exemplary QMS of a sample company – your guide to finalizing your own QMS documentation.